In February 2017 I visited one country in East Africa, Uganda, and one country in Central Africa, Cameroon. The Uganda part was organized by African Jungle Adventures. I was very happy with their organization, everything worked out very well. but they had arranged for a hotel room to get some sleep before the tour got started. We got started around 12 noon with a transfer by boat to Ngamba Island. On Ngamba Island is a Chimpanzee Sanctuary for orphaned chimps. There are currently 49 chimps in the sanctuary. The chimps have almost the whole island for themselves, people are only in a small portion. We were there for the daily feeding. On the way to and from the island we actually crossed the equator. The next day we drove to Kidepo Valley National Park, with a one-night stopover in Gulu Town. I stayed at the Nga'Moru Wilderness Camp for two nights. I had a nice, comfortable permanent tent with shower and bathroom. I had a game drive in the afternoon and a full day of game watching the next day. During the animal watching I realized that my guide didn't know birds and other animals very well. We managed to find a scientist that was making observations in the park to go with us on the full day to help with identifying birds. On many park visits during the tour I had a local guide that was familiar with the wildlife, so the lack of in-depth knowledge of my guide was not a problem. He did have a bird field guide book, so we were able to identify almost all of the birds that we saw. Kidepo Valley National Park has very nice wildlife, I was happy that I had asked the tour operator to include this park in the itinerary, even though it meant quite a bit of driving. After the second night at Kidepo we drove back southwest to Murchison Falls, where I stayed at the Murchison Falls Lodge for two nights. The lodge is very nice with accommodations in large permanent tents with nice shower and bathroom facilities. During the full day I had a game drive to the Nyamsika plateau. In the afternoon I was on a boat trip on the Victoria Nile to the base of the Murchison Falls. It was very interesting, with a lot of bird life along the river and a great view of the falls. The next day we drove to the top of the falls and watched the falls from above. It is quite an impressive sight. We then continued on to Fort Portal for two nights. On the way we had a flat tire. Normally that should not be a problem, we had three spare tires with us. However it so happened that the jack that was in the car didn't work. My guide tried for quite a while to jack up the car without success. We were very fortunate that it happened just about 500 m (1,640 ft) from a forest lodge. Most of the time during the drive we were many kilometers/miles from any civilization. After we got the tire changed with help from the lodge, my guide stopped in the next town to get the tire fixed and to buy a new jack. From Fort Portal we went to the Kibale National Forest in the morning to see another of the Great Apes, the Eastern Chimpanzees (Pan troglodytes schweinfurthii, german: Gemeiner Schimpanse). In the afternoon I went on a hike through the Bigodi Swamp. Chimpanzee tracking was fantastic. 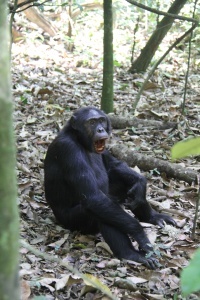 I had done chimpanzee tracking in Rwanda, but it was MUCH better in Kibale. I saw a lot more chimps. The guide for my group was really good, he managed to find a group of chimps that had come down from the trees and were moving around on the ground. We got much closer to them and saw them much better. Most of the visitor groups (there were 7 or 8 groups) didn't see chimps on the ground. The afternoon hike in the Bigodi swamps was relaxing. I saw a lot of birds on that hike, plus several species of monkeys. After the second night at Fort Portal we continued on to Queen Elizabeth National Park. I stayed at the Enganzi Lodge, south of the park. Again, the accommodations were very nice in a permanent tent with shower and bathroom. We went on a game drive in the afternoon, and another one (with a local guide) the next morning. The game drive included a visit to the mating grounds of the Ugandan Kob (Kobus kob thomasi, german: Uganda-Grasantilope, french: Cobe de Buffon). After that I went on a boat ride on the Kazinga Channel, the connection between Lake Edward and Lake George. I saw a lot of wildlife on that boat trip, it was well worth the trip. Altogether, there is less variety of larger animals in this park, but I did see quite a few birds. After the second night we continued on to Bwindi Impenetrable Forest National Park, to see the largest of the Great Apes, the Mountain Gorillas (Gorilla beringei beringei, german: Berggorilla, french: Gorille des montagnes). I stayed at the Gorilla Mist Camp. This was the least luxurious hotel of the trip, but still quite acceptable. The Bwindi Impenetrable Forest is a UNESCO World Heritage Site. After the first night at the Gorilla Mist Camp we went gorilla tracking. It was a pretty hard hike. We hiked down a very steep mountain, about 300 m (980 ft), till we got to an area with dense vegetation. It took us about 1 hour. From there on, our guides had to cut through the vegetation with their machetes. We hiked around there for about one hour and saw several gorillas feeding in the dense vegetation. It was interesting, but it was by far not as great an experience as I had in Rwanda. I guess I was very lucky in Rwanda, and very unlucky in Uganda. After we left the gorillas, we had to hike back up the mountain. Fortunately, I am hiking almost daily on much more difficult hikes, so I had no problems, but several of the people in the group had a difficult time. In the afternoon I went on a bird watching walk with a local guide. I saw a lot of birds on that walk, including several endemic species. After the second night we continued northeast to Lake Mburo National Park, where we stayed for another two nights at the Lake Mburo Safari Lodge. In the afternoon I went on a boat tour on Lake Mburo. We saw lots of birds, including a Giant Kingfisher (Megaceryle maxima, german: Riesenfischer, french: Martin-pêcheur géant), as well as Hippopotamus (Hippopotamus amphibius, german: Flusspferd, french: Hippopotame amphibie) and African Buffalo (Syncerus caffer, german: Kaffernbüffel, french: Buffle d'Afrique). The next day I went on a full day game drive. On this drive I finally saw Common Eland (Taurotragus oryx, german: Elenantilope, french: Éland), the largest antelope. After the second night at Lake Mburo Safari Lodge we drove back to Entebbe. I did a nature walk in the botanical garden in Entebbe, where I saw again a lot of birds. My flight left late at night to Nairobi, where I spent 7 hours in the airport before my flight to Cameroon. Almost all the lodges where very nice and clean, with nice facilities. I was very happy with the the selection of accommodations. Food in all the lodges was excellent. Beer was good, your usual German style lager, just what I like. It was fairly inexpensive, around $2.00 for 0.5 l (0.5 quarts). Roads were pretty good to very good. In the north we were on quite a few dirt roads, but they were all in very good shape. The paved roads were all in good shape. The one exception was the road from the Queen Elizabeth National Park to the Enganzi Lodge. That road was originally a paved road, but it was essentially destroyed by heavy truck traffic. People seemed to be friendly, as much as I could see. I didn't really get in contact with local people very much, only in the lodges. I had a great time in Uganda. The wildlife was great, I saw a lot of birds. The highlight I guess were the chimpanzees for me. For older people like me, the name Uganda immediately brings the memory of Idi Amin and the Entebbe Raid. Don't let this keep you from visiting Uganda, there is nothing left of these times. Uganda is making real efforts to accommodate tourism and it shows. They have great facilities, many nice National Parks, and interesting wildlife. This country is definitely worth a visit. It is completely different from Cameroon, which I visited immediately after Uganda. 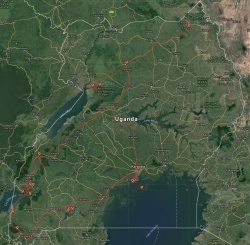 Following are links to pages with pictures from Uganda.